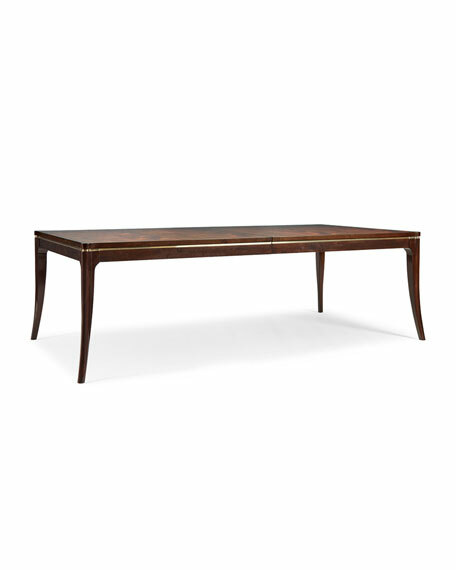 A restrained yet elegant silhouette defines this statement-making rectangular mahogany dining table. Our Go With The Grain finish, which we custom designed, brings out the mahogany grain on the table's top and offers a subtle gold fleck which is suspended in the finish. The legs and table apron are finished in a complementary Espresso Bean finish. A thin, delicate Gold Bullion bead delineates the table's apron. 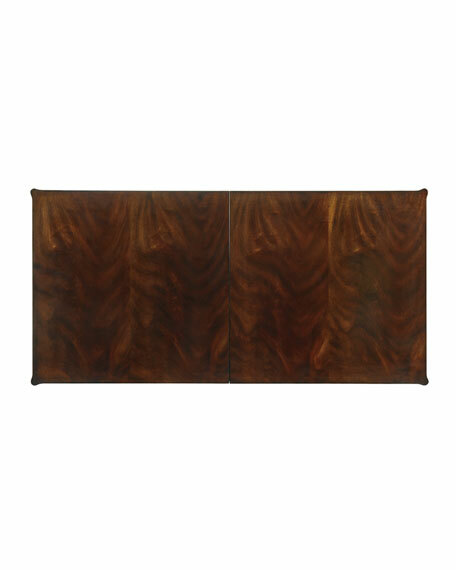 This gracious dining table is 98-inches long and can be extended with two leaves to 142-inches. Open Invitation's gracious 50-inch width allows for two small side chairs at each end, for those special occasions when a couple of extra friends drop by. Handcrafted dining table with metal trim. Table extends to 142" with two 22" leaves. Distance from floor to bottom of apron: 26.25". Distance between legs without leaf: 41.75". Distance between legs with leaf: 90.25". Distance between legs on side: 41.75". Overall: 98"W x 50"D x 30.3"T.
Boxed weight, approximately 354.2 lbs.